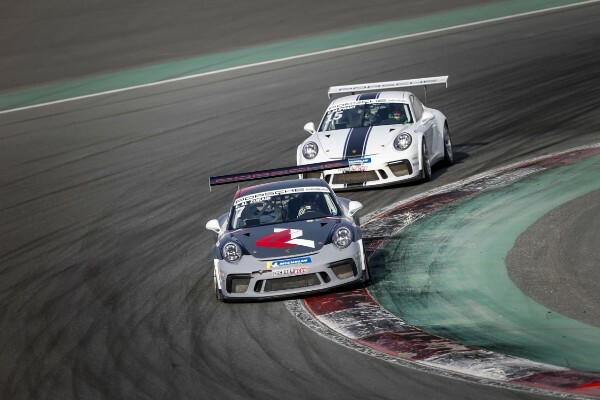 The intense battle for the drivers’ championship in the Porsche GT3 Cup Challenge Middle East remains remarkably close, as Oman’s Al Faisal Al Zubair took a deserved victory to complete Round 3 at the Dubai Autodrome. Al Zubair controlled the 14-lap race from the front to push main rival and championship leader Tom Oliphant into second place. The returning Dylan Pereira of Luxembourg crossed the line in third. The result narrows the gap in the overall standings with Britain’s Oliphant (144 pts) now only six points clear of Al Zubair (138 pts) at the half way point in the series. Dutch driver Charlie Frijns (112 pts) is third overall, courtesy of a fourth-place finish today. Al Zubair and Oliphant, the two standout drivers who have been engrossed in an epic tussle throughout Season 9, immediately renewed their sporting rivalry for the second time in consequence days. But on this occasion Al Zubair made amends for the mistake he made in the opening race and reversed the result from the previous day when Oliphant had claimed the win. For winner Al Zubair the important and necessary victory appeared straightforward. He qualified quickest to take pole on the 17-car grid and led from the start to the finish, to win by a mere 0.732 seconds. Speaking after the race, a relieved Al Zubair said: “Good start, good laps, good race, good win! The result today has topped off my weekend and, after feeling that I should have won the race yesterday, I managed to put things right today. I qualified on pole with some very quick times and knew that in the race I would just have to get my head down and go for it. Looking ahead the pace shows no sign of slowing as we enter the second half of the season. Drivers and fans will not have to wait long for the next instalment of the head-to-head fight for the drivers’ title between the sparring duo locked at the top of the standings. In one week the championship heads to the UAE capital, as Yas Marina Circuit hosts the region’s first and only professional series for Round 4 under the impressive lights. The seventh and eighth race of the twelve-race season will take place on the 2nd and 3rdFebruary 2018. Dutchman Charlie Frijns will be pleased to earn more valuable points by finishing fourth, but is bound to be disappointed after dropping two places in the race having qualified in second. Arguably the drive of the day went to GCC Rookie Khalid Al Wahaibi who secured a career high fifth place finish to win both the Rookie and Silver categories. Also, notable for his continued progress in an outstanding debut season, Scotland’s Glynn Geddie came sixth. The Porsche GT3 Cup Challenge Middle East races next at Abu Dhabi’s Yas Marina Circuit, 2nd – 3rd February 2018. The final two rounds will be held in Bahrain, with the series coming to a thrilling conclusion as an official support race for the 2018 Formula 1 Gulf Air Bahrain Grand Prix.